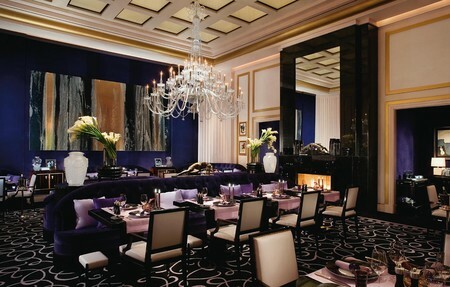 Joel Robuchon at the MGM Grand is the destination for extravagance. World renowned chef Joel Robuchon and his skilled team have meticulously crafted this eponymous restaurant with attention paid to every detail from the luscious décor to the artful French-inspired cuisine, presented in a traditional and elaborate multi-course meal. It is opulence at its finest, a true feast for all the senses that reinstills a sense of celebration and revelry into the dining experience. Tranquil Joel Robuchon seems a world away from the noise and traffic of the MGM Grand’s casino that lies just outside its doors. Inside, diners find themselves immersed in a hushed splendor and decadent surroundings reminiscent of a historic European manor. 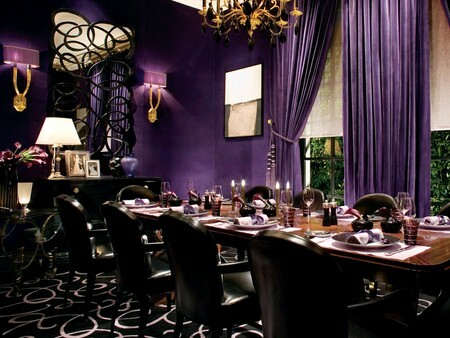 Crystal chandeliers hang from every ceiling, while plush purple velvet couches offer luxuriously individual dining niches in the main dining room. French doors lead to La Terrasse, the restaurant’s faux garden seating complete with a wall of creeping ivy, live flower beds, and Classical sculptures that capture the serene, orderly beauty of a French garden. A separate private dining room echoes the elegance of the rest of the restaurant, offering views of La Terrasse through windows and décor suggestive of a private parlor. Seating is purposefully limited at Joel Robuchon in order to encourage the sense of intimacy and exclusivity that permeates the space. What truly sets Joel Robuchon apart is the careful consideration paid to the minutest of details. From the hand painted bread and mignardises (candy) carts to the conscientious and gracious staff, each moment of the experience is designed to lavish attention on the guest. Even the smallest decorative accents are subject to scrutiny, with flowers, table runners, glasses and serving dishes changing in accordance with the seasons. The same level of care and precision evident in the décor is mirrored in the restaurant’s breath-taking cuisine. Executive Chef Claude Le Tohic has mastered Chef Robuchon’s uniquely complex minimalism, crafting intricate dishes with simple, clean flavors. Following the French tradition, each dish is grouped together in six, sixteen, or seasonal eight course prix-fixe dinners, creating a parade of flavor and presentation that reminds diners how to truly appreciate the art of fine cuisine. Although for our visit we are treated to an abridged version of the regular multi-course dining event, the experience is no less indulgent. The bread cart is wheeled to our table and its staggering variety is detailed by our helpful server. Each loaf and roll is baked in house and features such inventive options as Bacon Bread, Gruyere cheese Bread, French Olive, and Basil Focaccia. I opt for the Gruyere Cheese and Basil Focaccia: crusty and sharp, the Gruyere Cheese Bread is a bold and flavorful choice while the soft, green Basil Focaccia is fluffy and light with a hint of herby freshness. Le Bar arrives next, unveiled from beneath a glass dome at the table and saturating the air with the bright, spring-like aromas of fish and vegetables. A piece of sea bass rests in a delicate green sauce with colorful julienned vegetables scattered around the plate. Brothy and fresh, the chiffonade flavors the fish with light flavors of cilantro and parsley for a taste that is the essence of the season. Acidic and sweet notes from the julienned bell peppers punctuate the dish and add crunch to the flaky, silken fish. The 2005 Movia Sauvignon Blanc that is paired with Le Bar amplifies the vernal freshness with subtle grass and citrus notes for a fuller bodied and lightly earthy complement. Le Foie Gras is presented next: the tender dumpling is nestled on top of a show-stopping, foliage-filled glass dish, whose green leaves mirror the bright green Savoy cabbage leaf wrapping. The dish’s namesake is revealed upon cutting into the dumpling, which emits the recognizably heady, earthy scent of foie gras. While the creamy potency of the foie gras dominates, the cabbage’s slight bitterness and the woodsy crunch of the bamboo shoots tucked inside add crispness that cuts through its intensity. It is a deft balance of the extreme richness of this luxury ingredient with a surprisingly delicate subtlety. La Langouste is unveiled from its glass dome and fills the air with a new perfume of fennel and the salty-sweet scent of lobster. The pinkish lobster meat swims in a sea of creamy orange Viognier broth punctuated by bits of fennel, miniature mushrooms, fava beans, and carrots. The anise notes of the fennel deepen the flavors of the rich, buttery lobster meat and the creamy, slight oceanic brine of the sauce it rests in. The mixture of vegetables and fungi each contribute their own distinctive characteristics to the dish: the sweetness of the carrots, the buttery crunch of the beans, and the deep earthiness of the mushrooms introduce different personalities and add additional delicious complications and nuances. The 2006 Meursault Chardonnay that accompanies La Langouste is an exquisite pairing: its quiet hints of anise mingle with its stronger floral notes and clean finish for a clever marriage of flavor. L’Aloe proves a refreshingly sweet addition to our spring-inspired meal. Coconut granite, aloe vera gelée and passion fruit cheesecake are layered in a tall glass cylinder entwined with a calla lily vine that adds a charming playfulness. The passion fruit’s tropical perfume teases the senses first, exploding with fruity sweetness upon first bite. The frosty, cool granite adds a nutty crunch that contrasts with the creamy cheesecake, while chunks of the aloe gelee surprise with floral freshness. It is an incomparable dessert, full of unexpected and exotic flavor revelations. The mignardises cart is wheeled to our table to sweeten the reluctant conclusion to our meal. We are offered a selection of tempting confections, including some classics like Dark Chocolate Ganache as well as a variety of more unusual varieties like Chocolate Covered Candied Orange Peel and Elderberry Meringue. Paired with coffee or tea, each mignardise is a sweetly indulgent surprise and showcases the astounding range of expertise found in the Joel Robuchon kitchen. Joel Robuchon makes any dining experience a special occasion, meant to be savored and indulged in. With its meticulous opulence, its unparalleled service, and exquisite cuisine, the restaurant deserves the hushed awe it tends to inspire whenever people step through its impressive doors. Corkage Fee: 100.00 | Per 750ml bottle. 2 bottle limit. Main Dining Room | Dinner 5:30 p.m. - 6:45 p.m.
Main Dining Room | Dinner 8:30 p.m. - 10 p.m.
What is the difference between Joel Robuchon and L'Atelier de Joel Robuchon? L'Atelier de Joel Robuchon is a separate restaurant from Joel Robuchon and L'Atelier de Joel Robuchon specializes in counter seating, where you are able to watch the chefs prepare your food. Joel Robuchon is the more formal restaurant of the two. Has the restaurant won any awards? The restaurant is the only 3 Star Michelin Guide Winner in Las Vegas. 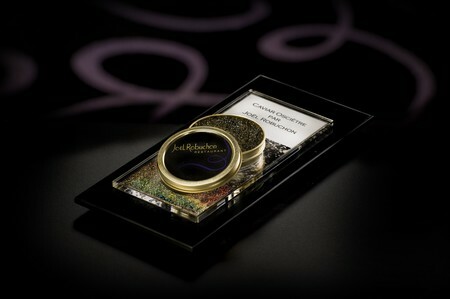 Joel Robuchon is also a Mobil 5 Star Award Winner and a AAA 5 Diamond Award Winner. What are the restaurant's signature dishes? The signature dishes are La Langoustine, Le Bar and La Fraise. Please see the menu for their descriptions. The dress attire for this restaurant is business elegant. Jeans, shorts, t-shirts, sneakers, beach and athletic wear will not be permitted. Jackets and collared shirts are required for gentlemen. $100 per bottle with a 2 bottle limit per visit. This 16 course Degustation menu $425 per person. Some dishes may contain raw or undercooked ingredients. This special tasting menu does not contain any shellfish. This special tasting menu offers vegetarian options. Best meal of our lives! Everything was beyond perfect, and the little niceties such as the keepsake gifts were unexpected and so nice. Awesome! Not to be missed! Joel Robuchon exceeded our expectations in every way. Will definitely book again when we are in Vegas. You truly feel that you have escaped the hustle and bustle of Vegas and landed in a relaxing, romantic oasis. Be forewarned about price, but you definitely get what you pay for. The food and service are incredible. Recommended highly; even if only for the incredible experience. What's to say, its Robuchon!!! Everybody should have the chance to eat at Robuchon's. It is a foodie's delight. I can't begin to describe how good the entire experience is. Try it!! This is a must-do for foodies in Vegas. Be sure and take advantage of the complimentary limo service from your hotel that walks you through the Mansion at MGM to the restaurant. It's easy to see why the Chef at JR received the James Beard Award for Best Chef in the Southwest this year -- everything about this meal exceeded my expectations. Transforming food to art, simply outstanding. 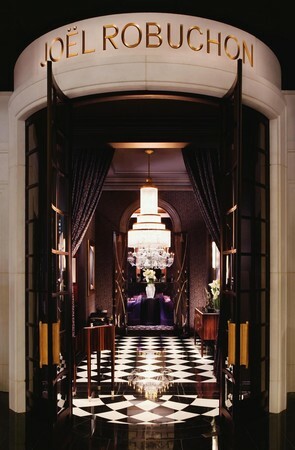 Once you enter the doors of Joel Robuchon's restaurant within seconds you forget that you are in a casino in Las Vegas. Every detail in this beautifully romanticized space adds to the mind bending flavors of the four hour event that is the sixteen course tasting menu. This was not dinner, it was a superb culinary experience lead by an expert team of servers. Bravo! Thanks to the staff for an excellent experience. My dinner at Joel Robuchon was incredible. I've eaten at some of the best restaurants in the US and Europe and this experience beat all of them. I was having a horrible day/week/month, from the moment the limo from the MGM Grand appeared, I felt like I was in a happy cocoon. Every aspect of service was impeccable. The food was so good that if you had no taste buds, you'd still want to eat it for the progression and variety of textures alone. Next time I'm bringing along a dining companion, female, male, friend or sworn enemy. This is too good not to share! it was no doubt the best dining experience ever..from the limo service to being greeted at the entrance and everything else that followed was an amazing dining event that I will never forget. My wife and I vacation in Las Vegas often. We love the vibe and the meal options. Joel Robuchon was on our list of "must see" restaurants. We chose them for our 19th wedding anniversary dinner. Service and attention to detail were exquisite. Staff was attentive without smothering us. Great wine by the glass options PLUS a wine list "to die for". Only negative is that I would have loved a wine pairing with every menu option. We are not french wine masters and I would have appreciated a sommelier's recommendations for our fixed menu choice. Although in the middle of MGM, the restaurant is well insulated to the noise and hubub. We had a quiet, romantic dinner that we both enjoyed. our evening at joel robuchon was absolute perfection. food was gorgeous, truly inspired. service was impeccable - the wait staff were attentive and gracious, the maitre d' was competant and classy. our dining experience was so superb that we went back the next night for a quiet classy cappucino after a disastrous meal at another "celebrity chef" restaurant! The meal we had at Joel Robuchon was unbelievable. It was the best dining experience we have ever had, from the Limo ride there to the diners entrance to the chocolates cart at the end of the meal it was absolutely amazing. If you are in Vegas this restaurant is a must. We would definately return. It is an expensive meal but it is so worth the money. My wife and I were in Vegas celebrating our anniversery and ate dinner at Joel Robuchon. The entire experience was remarkable, the food, the service and the ambiance. The food was so great along with the service. What an elegant night. We were celebrating a birthday and they made it especially special. We will make an effort to return again the next time we are visiting Las Vegas. This restaurant is incredible. The service, food and ambiance is outstanding. It is a true dining experience recommended to all. My husband and I have eaten at some of the finest restaurants in the world: ie; Le Circque, Lutece, Taillvent etc. This restaurant was OUTSTANDING in every way. A real experience. Be prepared though, not for the faint of wallet. We went to Joel Robuchon the last night of our Las Vegas week. It could not have been a better ending!! This is a once in a lifetime experience. That´s what we thought. But because it was so relaxed and luxurious and perfect at same time, we´ll do it as soon we have the opportunity! Thank you! Couldn't have been better, down to each and every piece of bread, and I tried a lot of them! Service was excellent, attentive, friendly, not stuffy. My husband ordered from the chef's 16 course menu and his exact words were "This is not a meal, this is not dining, this is an intimate experience. Something I have never experienced before. I am blown away" After about his 5th or 6th course he swore he could not eat another bite. I assured him that the chef undestands the "science" of a pallette and the chef would dictate when he would be full. He ate all 16 courses and felt perfect. The ambiance was incredible, the service was impecable, and we will definetly be returning! A foodie obligation when visiting Vegas. Although, ridiculously expensive, Joel Robuchon was an experience I will always remember... Every bite exhilarating... The finest of cuisine and gastronomy! From start to finish the overall dining experience was one my wife and I will never forget...We will ABSOLUTELY come again next time we are in Vegas!! This restaurant is the perfect place for a special dinner. The menu offers many delicious choices, each prepared and presented to the highest quality standards. The atmosphere is beautiful, calm, romantic and inviting. The wait staff are courteous, helpful and attentive with the right measure of discretion. Open your mind to the wonderful world of French food and the French dining experience. Your meal will begin with the charming opportunity to choose from a large selection of specially prepared fresh breads served with butter that tastes fresh from the farm. Your deliciously prepared, personally selected appetizers and main course will follow in perfect time. After a choice of delectable cheeses from the cheese cart or a dessert (or both) you will be delighted once again by the presentation of well over 30 different mignardises (tiny confections of every imaginable kind) from which to choose a selection to punctuate the end to your wonderful meal. Take your time, relax and enjoy a feast for the eyes and the palate while spending a quiet,enchanting evening in beautiful surroundings. PS: Do be prepared to spend a bit. With a choice of complete menus ranging from $120 to $240 per person, the cost for a dinner for two, including cocktails, wine and gratuity will not be cheap but I think you will find it will be worth every penny. Outstanding ambience, exceptional food and professional staff made this a memorable evening as did the bill. But, I wouldndo it again. It was everything I expected. The food, the service, the ambiance. A perfectly choreographed evening to be remembered. The service was amazing - we were very pleased with the service, the menu selection and the input from our sommelier. The desserts were absolutely decadent. One of our best dining experiences. If you are looking for a beautiful restaurant in Las Vegas, this is it! Joel Ra Buchons might be one of my favorite restaurants ever. A wonderful experience-from the 1st amuse bouche to the last petit fours. I will come here EVERY time I am in Vegas from now on. My wife actually had goose bumps over more than one of the courses! I felt like my whole life of eating great food had led me here. I was not let down! The Master should be proud of his American restaurant. Thank you! We felt the food we had was among the best we've had anywhere in the world. Comparable with a place like Marcus Wearing in London. We were very pleased. Great food, nice service. Some confusion about which restaurant to place us. We were clear when we called because we asked for the fixed menu. Overall great food, presentation, and service for our foursome who all had the 16 course menu. Salmon tartare with caviar was exquisite. No cheese course included with the 16 course menu although they have a very impressive cheese trolley which we ordered as an additional item. Might be better to substitute a cheese course for one of the 2 desserts that were included. My second visit here and both times wine glasses were not automatically refilled the first time they were empty. Once reminded, it did not happen again thorughout the meal. Worst restaurant I've ever been to. Pretty much nothing about it was good. We decided to start with a dessert for fun and the waiter said very well and took our menus and about 10 minutes later we were told the manager would like us to "feel more comfortable" in the lounge. Once we moved it took another 15 minutes for our food to arrive. We decided to eat our $80.00 desserts and just leave. It is too pricy as a restaurant and the options are very limited. In my opinion is not worth it at all.